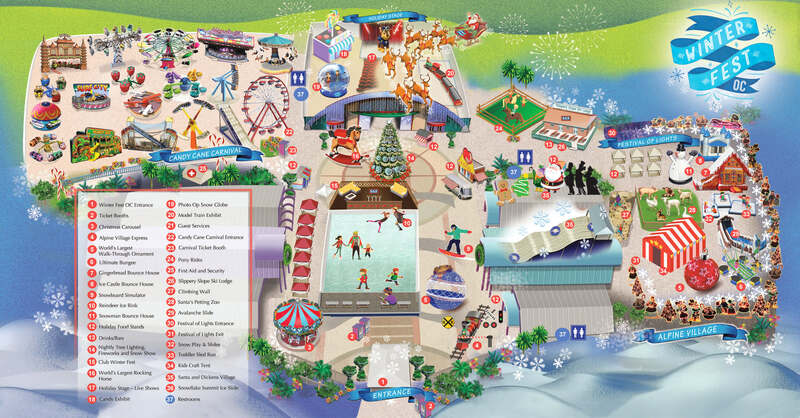 Winter Fest is located at the OC Fair & Event Center on 88 Fair Drive, Costa Mesa, California 92626. Here are suggested routes to get here. 5 South or 405 South to 55 South. Exit Del Mar/Fair Drive. 91 West to 55 South. Exit Del Mar/Fair Drive. 5 North to 405 North to 55 South. Exit Del Mar/Fair Drive. Alternate Route High Traffic Periods: From the 405 Freeway, exit Fairview Road, drive South and follow directional parking signs. Bike racks are conveniently located near each public entrance – Blue Gate, Green Gate and Yellow Gate – for no charge. Guests must bring their own lock. Spend less time on the road and more time at Winter Fest with The Toll Roads. Simply drive the 73, 133, 241 or 261 Toll Roads to the OC Fair. No account? No problem. Simply pay your fees within 48 hours using The Toll Roads’ On-Time-Toll™. Tolls can be paid online at thetollroads.com or with The Toll Roads app. For more information, visit The Toll Roads. FasTrak® or ExpressAccount™ is the best option for frequent users of The Toll Roads. See you on The Toll Roads.